I lived in Iowa for 20 years. During that time, I never had much interest in seeing The Brides of Madison County, either the film or the actual bridges. The film came out when I was 11, at a time when Ace Ventura sequels were more my bag. Watching old people on a farm didn’t quite do it for me. It wasn’t until my move to New York was imminent that I thought to seek out the film. What better way to leave my home base than to watch one of its quintessential films? I didn’t get around to. 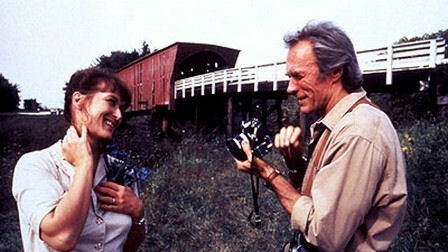 Watching The Bridges of Madison County in my New York bedroom, however, provided its own set of surreal pleasures. I can say the film resonated very little with my Iowa experience. I can also say it made me cry. Clint Eastwood‘s films have a way of pinpointing my softie spot and hammering it with blue-collar diligence. Only two other working directors have a comparable effect on me: Wong Kar Wai and Nuri Bilge Ceylan. Those directors hit me on an arty, existential level; I experience something like profound terror after a Wong Kar Wai film, a feeling I can’t quite put into words. Eastwood’s films are different. Putting them into words is easy: They’re sad. Eastwood goes for the old-fashioned punch to the stomach. He crafts simple stories with the clear intention of making you weep. Top Films of the 2000s: #1 Mulholland Dr. This review originally appeared on Quarantine the Past on January 1, 2010. The original links have been removed because, well, WordPress wasn’t liking them. As this is an extension of my previous blog, Quarantine the Past, I’ll be uploading some of my previous musings for a more permanent home here on Print the Legend. I will label these posts clearly as archival. Expect more new content shortly, including a review of the 2010 Werner Herzog film My Son, My Son, What Have Ye Done? Ilich Ramirez Sanchez, aka Carlos, aka Carlos the Jackal, needs you to know a few things. Namely, that he’s smarter and suaver than you in every way. Ten minutes into Carlos, the new biopic from director Olivier Assayas, Carlos eases into a cab and mutters, “Don’t drive in circles; I know Beirut” before the driver can even begin to rip him off. Translation: Don’t even try it. I’m one step ahead of you, always. Fulfill your function and get out of my life. Assayas underscores the moment with a blast of propulsive post-punk, turning an everyday exchange into something exhilarating. Carlos may be an insufferable human being, but, on the film screen, he’s a giant, a transfixing egomaniac. He embodies swagger. Right away, Assayas treats us to simple pleasures: A cocksure dude rides around Beirut, looking cool as hell, while The Feelies kill it on the soundtrack.